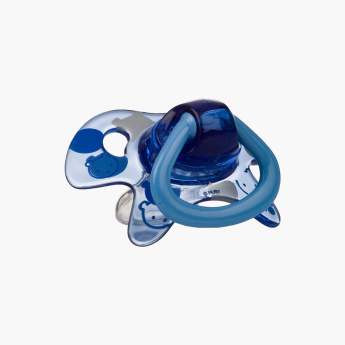 Nuby Printed Orthodontic Pacifier | Blue | massage and stimulate your baby's gums. Specially designed for use during the teething phase of your little one, this printed pacifier is BPA-free and offers immense comfort to your baby’s sore gums. With attractive prints and a handle at the back to offer a good grip, it massages and stimulates your baby’s gums.